높이 7∼8m의 자연 암석을 다듬고 바위면 전체에 꽉 채워 조각한 마애불로 전체적으로 장대하며 힘찬 솜씨를 보이고 있어 고려 초기에 만든 것으로 추정된다. 머리와 양 손은 얕은 돋을새김으로 표현하였고 옷주름 등은 선으로 조각되었다. 원만하고 둥근 얼굴에 이목구비가 크고 뚜렷하며 지그시 감은 듯한 눈과 굵직한 코, 두터운 입술 등에서 힘차고 후덕한 고승의 느낌을 갖게 한다. 양 손은 가슴에 모아 엄지와 약지를 맞대고 있으며, 손바닥이 밖을 향하고 있는 설법하는 모양이다. 왼쪽 어깨를 감싼 옷은 부드러운 사선을 그리며 흐르고, 끝에서는 지그재그 모양으로 마무리되어 있다. 옷주름선은 소박한 모습이며, 스님의 얼굴에 어울리는 은은한 덕망의 분위기가 느껴진다. 영월암의 창건조사 혹은 이 사찰과 인연이 깊은 나한이나 고승을 기리기 위해 만들어진 것으로 생각되며 유례가 드문 고려시대 마애조사상이란 점에서 중요한 의의를 갖는 작품이다. 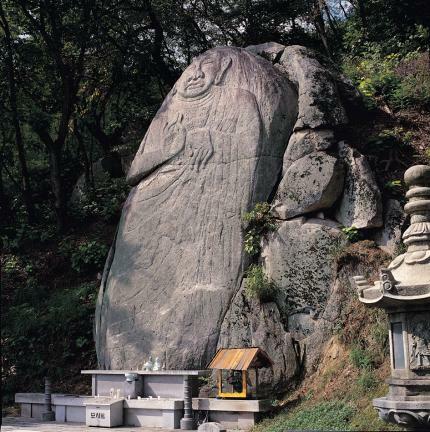 This is a rock-carved Buddha for which about a 7m to 8m high natural rock was processed to carve the statue of Buddha on the whole rock. The head and both hands are carved thin in relief and the pleats and so on are carved in a line. The entire contour of face is distinct with a round, quiet face. 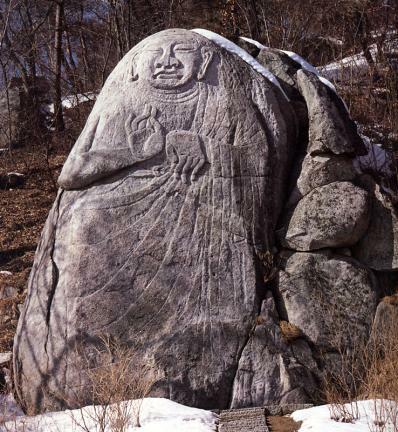 The sincerely closed eyes, large nose and thick lips give the feeling of a strong and virtuous high monk. There is samdo, i.e. the three wrinkles on the neck. It has a preaching appearance in that the hands, whose palms are facing outwards, are joined together on the chest with the thumb and forefinger abutting on each other. The robe over the left shoulder makes a flexible curve, and it is finished with a zigzag shape at the end. The pleats are simple, and a merciful and virtuous feeling is apparent on the face of the monk. 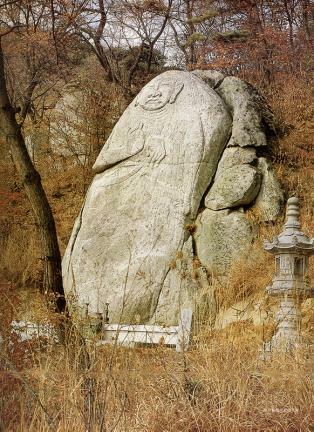 It shows powerful and sophisticated skills, making it possible to guess that it was created in the early days of Goryeo. 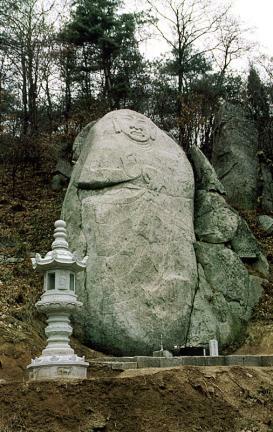 It is thought to have been made to commemorate the monk who constructed Yeongworam Hermitage, or else an arahant or high monk who was deeply involved in the temple. 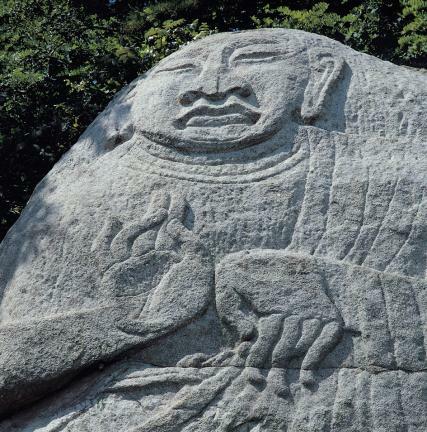 This carving has great significance because it is rare example of a rock-carved statue inspired by a temple founder in Goryeo.